Can you imagine yourself walking into a classroom and seeing a teacher with preschoolers sitting on the floor, in a circle, attempting to grow a gigantic flower with their bodies that buds, blooms, wilts, and dissolves? What about kindergartners going on a transcontinental adventure by swimming across a raging river, climbing up a mountain, and finally, riding horseback to arrive at the sparkling Pacific Ocean? Or first grade students connecting with each other by using different body parts to make geometric shapes that then build and transform into a sheltering structure? These are small glimpses of the excitement that can be created by incorporating movement into early education. In many schools across America, arts education is being crowded out by the focus on standardized academic tests that have an enormous impact on student advancement, drive teacher and administrator compensation, and can even determine if a school is permitted to remain in operation. Out of all the arts, dance education is often seen as the most “optional” of enrichment subjects, relegated to an infrequent “special” or an extracurricular funded by the PTA. And yet recent research into how children actually learn and develop cognitively is making it clear that movement is one of the most powerful tools to create engaged learners, strengthen memory and executive function, and regulate arousal states and behavior. By eliminating movement from the curriculum, we risk creating young minds that are stunted and unable to achieve their full learning potential. Not only should movement and dance be part of every child’s education, we believe that it belongs as a daily core part of the curriculum and pedagogical approach for sound and healthy cognitive and emotional development. Anyone who has spent any extended time around young children knows that getting kids moving is the surest corrective when attention spans hit the wall and behavior begins to deteriorate. The connection between motion and learning is hardwired into our brain structure from the tens of thousands of years our ancestors spent roaming and exploring their surroundings. Movement is central to how children learn about themselves, flex signal processing powers, and explore the world. Through movement, young minds develop physical awareness and body control, learn to follow instructions and listen for cues, and gain respect for others within a shared space. Creative movement and dance can be used as a structured tool to accelerate the mechanism of psychomotor learning and social and emotional regulation. Movement activates the cerebellum, connecting neural pathways of sight, balance, attention, and stimulation. Dance and movement can be used as disciplines to raise and lower the internal arousal state through breathing, balance, physical exertion, and mental image formation. Children become aware of, and then learn to self-regulate, their own energy states. Structured movement also switches on core brain pathways related to sequencing, timing, predicting, and rehearsing tasks to achieve defined outcomes. Thus, dance is a powerful tool to strengthen executive functioning that supports the transition to higher order cognitive thinking and planning that children need to be successful in both school and life. Dance is an inherently social activity (there must be some reason humans have been engaging in it since the dawn of recorded time!) and a powerful reinforcement to music sense. Dance contributes to both awareness of one’s body in space (proprioception) and awareness of one’s relation to other bodies in space. Taught properly, it is a highly effective kinesthetic learning mechanism for counting, rhythm, mutual respect, and improvisation. Because dance is an entry point for all types of students in developing their cognitive, physical, emotional, and social skills, there is a large amount of literature that advocates that dance education should be a mandatory part of the curriculum for Pre K-12 grade levels. But too often good intentions are swept aside by bureaucratic mandates within the context of limited funding. Education suffers when movement becomes the “redheaded stepchild” left out on the schoolhouse stoop. Why Is Creative Movement and Dance Important? Dance is an activity that uses all three domains of knowledge: cognitive, affective and psychomotor, making it a uniquely powerful support for other academic and cultural learning. With imagination and commitment to collaboration, dance can be integrated with subjects, ranging from math, foreign language acquisition, physics, visual arts, and history, so as to render them more relevant and interesting for students. Students who make geometric shapes with their bodies, use “skywriting” to reinforce the alphabet, or master period dance styles are more likely to retain the academic context than those who simply get “chalk and talk” lectures or stare into tablet screens. Dance education reaches far beyond traditional images of children in tights and ballet shoes replicating poses of the 19th century. A dance curriculum that mixes sound technique with improvisation, draws from a range of cultural traditions and periods in a way that ties with academic sequencing, and uses both contemporary and historical musical idioms can quickly become the highlight of children’s school day. Howard Gardner’s Multiple Intelligences theory provides substantial support for viewing dance as an intellectual and affective activity. Having a robust arts curriculum that includes dance can help to enhance development of the imagination, and provide greater motivation to learn, increased student creativity, lower dropout rates and increased social skills. Children at this developmental stage are able to distinguish between the subjective world inside themselves, and the objective outside realm outside. They are curious about how the world works, and learn more effectively and meaningfully when content is connected to their real-world life experiences and curiosity. Language development increases rapidly between the ages of 6 and 11, and as kids start to tune into the emotions of others more fully, empathy begins to blossom. Moving to more structured dance education at this age helps stimulate mental alertness, heighten attention to detail, develop critical thinking, and promote deeper learning. Children can improve their self-esteem through dance by working on acceptance and appreciation of their bodies, experiencing the kinesthetic joy of movement, and making physical fitness part of their long-term life routine. For example, students might work on their locomotor movement skills while swimming across the room by using different levels while imagining the experience of the African diaspora and moving to the beats of talking drums. An exercise in mountain climbing tied to the Westward journey of Lewis & Clark might have kids explore different ways of climbing by moving backwards on their backs, or by making chains that carry them to new summits through cadenced movement. Movement is a way of reaching children, by opening doors to imagination, kindling sparks of improvisation, and sharpening ability to plan, rehearse, fail, and improve with increasingly complex movement sequences. Just as with language, children first become comfortable speaking the “language of dance” without ever thinking about it, then learn dance notation with Laban movement analysis, and then progress to higher order appreciation and analysis of different dance styles and master dancers and choreographers. Pedagogical thinkers ranging from John Dewey, to Rudolf Steiner and Maria Montessori have all been strong voices advocating a more intense focus on body movement, dance, art and music in the early childhood development. Creative movement helps children to move in new ways and helps them learn that there can be more than one solution to a question, a problem, or a task. Dance Strengthens Imagination — Creative movement and dance activities integrate imaginative ideas to engage children’s learning such as providing various images for warm-up and making a dance in a specific theme. By connecting the planes of imagery, ideas, movement, balance, and social interactions, dance inherently induces multi-planar modes of thinking, which are central to artistic and imaginative development. In creative movement there are no wrong answers and experimentation is always rewarded. Students learn to think outside the box to find new expressions of creativity. Dance Promotes Physical Development — In creative movement, children learn body control, gain respect for personal space, and accelerate the development of gross and fine motor skills. They improve their coordination, balance, stamina and strength. This forms the basis for healthy movement and development of musculature and skeletal system. This development can move, later into somatics, which can incorporate Alexander technique, yoga, and other disciplines of posture and breath. Dance Is Inherently Social — Creative movement quickens social and emotional development. Children learn to work together and value each individual's contributions. They learn to listen and respond to directions, offer suggestions, explore each other's ideas while moving together. Dance is a means of telling stories about relationships, struggles, perseverance, emotion, and community. Dance Promotes Explosive Neural Growth — Due to the unique power of kinesthetic learning, dance stimulates the development of critical brain structures that will determine children’s academic and life success. According to research by Harvard psychiatrist John J. Ratey, dance can have profound impact including: optimizing alertness, attention, and motivation; preparing nerve cells to bind with one another and form new pathways; and stimulating growth of new nerve cells in the hippocampus. So Why Should Children Dance? Dance fills a basic human drive for movement, emotion, expression, and connection, and thus, like music, has been part of all human societies. For children, movement and dance are an irreplaceable element of sound and healthy cognitive, social, and physical development. Dance connects students to their own bodies, and enables them to interact with others in a structured, respectful, and creative way. The five basic elements of dance are the body, action, space, time and energy. In a children’s dance class that is properly taught, all levels of learning and multiple regions of the brain are engaged at once, in a way no other discipline can achieve. Success in movement and dance leads children to become more self-directed, self-aware and self-actualizing. They are able to regulate their energy, blow out the mental “cobwebs,” and sustain higher levels of attention in other subjects. The documentary PS Dance gives a flavor of how versatile a tool dance can be for both learning and empowerment in the hands of master teachers in a wide range of social and age groups. At MUSE Academy we believe so strongly in the importance of movement and dance, that it is a core daily subject for our students beginning in pre-K 3. 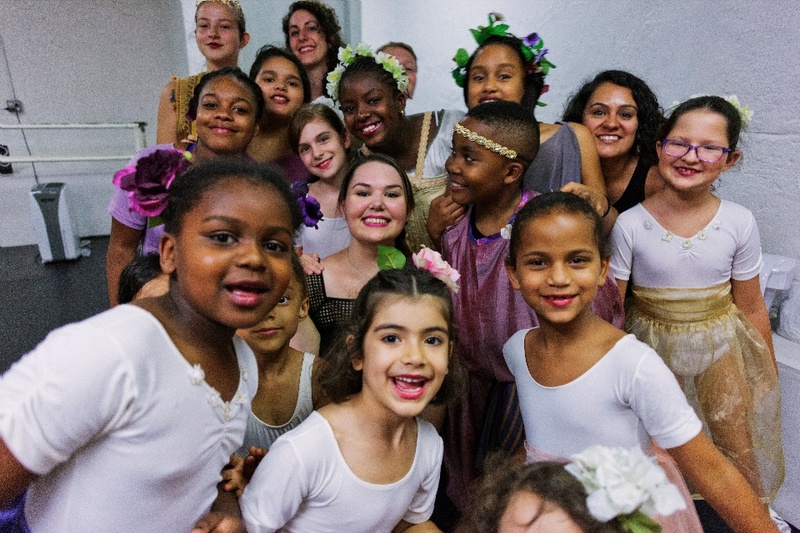 While only a small number of students may end up pursuing the life of a professional dancer, all of them will have their lives enriched by the positive impact on their holistic development, early exposure to the joy of movement, and a lifelong appreciation for this multifaceted art form that is present in every culture in the world.